This page shows prices for paint grade, fiberglass-reinforced polymer (FRP), full round (not split), tapered, fluted shaft columns including a Roman Corinthian cap and an Attic base. Other caps and bases are available. Other caps and bases are available. Round paint grade fiberglass columns are a molded column with an average wall thickness of about a 1/2 inch. They feel like stone (very hard and solid), are very strong and durable. While the styles are usually not exactly architecturally correct, they are very close and are good looking columns. They have a very high load bearing capacity (vertical loads only) and hold paint well. Generally the cost is about half that of an architecturally correct wood column. Because it is a molded product the details may not be as crisp as a milled wood column but our feeling is most people would never notice the difference. 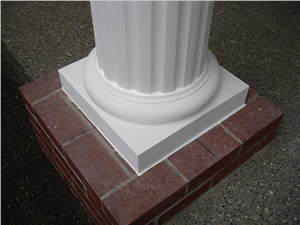 These round, tapered columns are low maintenance fiberglass-reinforced polymer (FRP). They're rot-proof, waterproof and insect-proof. Load-bearing shafts are made as one centrifugal-rotocast piece. Columns may also be ordered split, so they can wrap around existing supports. Split columns are non load-bearing and there's an additional charge for each split column. The price range for splitting goes from $21 for a 6-foot column to $289 for a 30-foot column. Prices on this page are for paint grade columns. Other color options and textures are available for an add-on charge. * On some sizes of columns, the fluting extends down to the top of the base as shown in the photo below. As an option, you can choose to alter the fluting.